Startseite » Was können Sie tun » Directions and routes in Georgian mountains. Travel Guides » Bidara Mt. Freeride routes from Mount Bidara, NE (northeast), E (east), SE (southeast), SW (southwest), W (west), NW (northwest), 1-3 km., ⎋ 02:30 h., ⇡ 00:40 h., ↑ 170 m., ↓ 1120 m., ▲ 3220 м. The immediate proximity of Mount Bidara and its adjacent ridges to the Gudauri Ski Resort, its quick accessibility via ski lifts, and a wide range of freeride routes of various levels of difficulty on various exposures of slopes can make your days unforgettable, whether you’re a novice freerider or a passionate professional riding on steep slopes and couloirs. Routes on Mount Bidara are very popular with freeriders. With each day after the last snowfall, choosing a descent line from Bidara with untouched snow becomes more and more difficult. The most difficult, steep, and hard-to-reach slopes and northwest couloirs are the last to be ridden. The mountain range of Bidara is located in the western part of the Gudauri Ski Resort. Using ski lifts, you can get very close to the beginning of a short ascent to the top or to one of the ridges. The angles of descent lines vary from 25 to 50 degrees. The relief is the most diverse, from broad, snowy fields to narrow, rocky couloirs. The region has a large number of combined routes, from those that use ski lifts to skitouring/backcountry routes. It takes 40 minutes to get from the top station of Sadzele lift to the beginning of the simplest route. Before going down to the opposite side of Mount Bidara, make sure that you can see moving traffic on the Cross Pass and on the Georgian Military Road, otherwise you will have to return to Gudauri on foot (10 km). It is impossible to characterize the safety of this region as a whole. One must take everything into account when choosing each particular route: the state of the snow cover, influence of the southern exposure and time of day on its stability, the different steepness of slopes, and relief traps. For example, in March-April on the most popular western slopes, there is a crust of ice in the first half of the day as a result of the day before’s evening sun in warmed-up air and the subsequent night temperature decrease. After lunch, the crust melts and the descent in the upper parts of the mountain is more comfortable. If you choose a descent to the resort, it is possible to return to one of the western ski slopes and further to the resort. If a descent to the opposite side of Gudauri is chosen, then it is possible to return to the resort after descending to the Georgian Military Road; order a taxi in advance (it is better to call a taxi driver right before the descent so that the driver does not wait for you and you do not overpay for his waiting). The standard cost of a car to meet you on the back side of Bidara is 50 GEL, and the journey time is 10-15 minutes. If you take this route with a friend (solo rides on this and any other route are unacceptable), you can hitchhike and return to the Gudauri Resort. The starting point of any route depends on whether the lift to the highest point of the resort (Sadzele mountain 3220 m.) is operating or not. If the ski lift "Sadzele" is operating, take the lift to the top and start your descent to Kobi Pass, altitude 2950 m. (GPS coordinates 42.51039, 44.49340). Then ascend to the summit of Bidara 3120 m. (GPS coordinates 44.48826, 42.51299). The next route depends on the selected descent line. 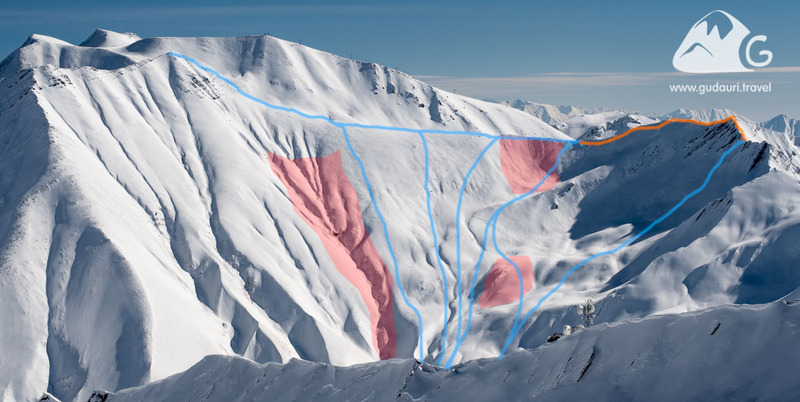 If the ski lift "Sadzele" is not operational (this happens on days of increased avalanche danger, hurricane wind, or insufficient snow cover), then the ascent will begin from the top station of the lift "Snow Park" (see the map of pistes and lifts). In this case, you’ll arrive immediately at the saddle on the ridge (GPS coordinates 42.50617, 44.48455). The next route depends on the selected descent line. When climbing to Mount Bidara from Kobi Pass, if the snow cover is stable, rather than ascend to the top, it is possible to traverse from the pass or higher along the ridge to the left, followed by a short climb to the ridge (GPS coordinates 42.50617, 44.48455).